Mounting a DXpedition is an expensive process. DXpeditions have traditionally paid their expenses using money received from sponsors, team members, and from individuals who receive their QSL cards after the DXpedition is over. An average QSO can cost from $0.72 to over $4 according to N1DG, treasurer of the NCDXF. 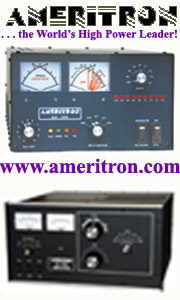 The eQSL.cc system is a fully automated QSL exchange. For the DXpedition, it reduces all of the QSL labor to a simple upload of the logs, either in real-time as the expedition is in progress, or after it has concluded. 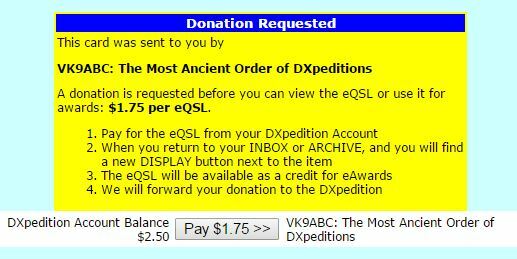 eQSL.cc continues to support DXpeditions with up-front donations of several hundred dollars, but we go one step further. In the physical world, DXpeditions often use OQRS to receive a payment for each QSL requested. Or they may have their own donation mechanism. We, too, mirror this per-card donation in the electronic QSL world. 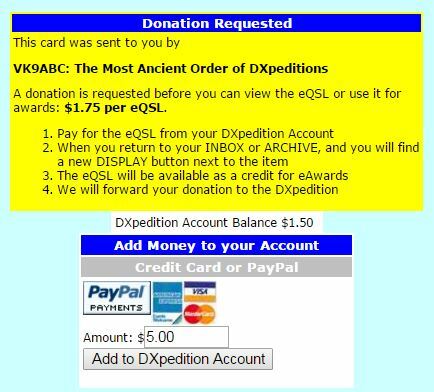 That is, if a DXpedition expects a donation of $1 per physical card, it can also receive a donation of $1 per electronic card, collected by us and forwarded to them periodically through a check or PayPal transfer. The difference is, there are no labels to apply, nothing to mail, no work required! 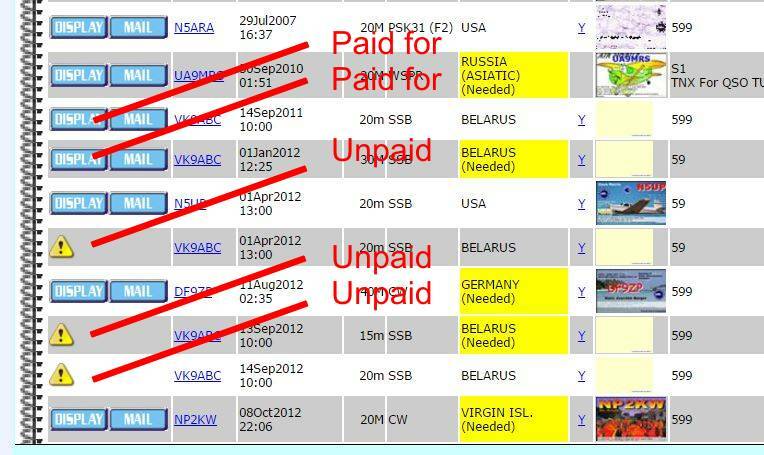 The DXpedition contacts us, and we set up the amount they would like to receive per eQSL. As they upload their logs, the eQSLs they upload show up in the recipients' InBox, but none of the details are visible, and the eQSL cannot be used yet for eAwards until a donation is made. The recipient makes a donation through our system, and then those eQSLs become visible and can be used for our eAwards too. We send the DXpedition a check or PayPal donation every month, minus a small handling charge, for as long as money continues to flow in. It is truly a huge savings in time for both the DXpedition and the individuals receiving their eQSLs. Don't think of it as paying for the QSO. 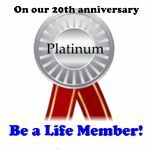 Think of it as making a donation to help reduce the QSL labor costs for the DXpedition. We can set up your logs to require a donation during an initial PAID period, and then after that the eQSLs are available at no charge. We will set up the mechanism for you and assist you with getting your custom card uploaded. During and after the DXpedition, we can also assist you with getting your logs uploaded if you have any trouble with the size of the logs.